Sci-fi author Winnie’s debut describes the origin of the vast, galaxy-spanning Terran Empire and the 31st-century ascent of a Mongolian prince who defends Earth and lays the groundwork for an immortal dynasty. America didn’t last much past the 23rd century. In the 31st, Mongolia is a dominant world power, and spacefaring humans have defeated one alien invasion, earning respect and fear among the alien Galactic Council. Angkor is a reluctant heir to the neo-Mongol throne, preferring his scientific research and idyllic, monogamous marriage to a commoner. But the machinations of politics demand that he not only succeed his father as the planet’s benevolent despot, but also revive the ancient god-king title of “Khan”—a sign that humanity plans to expand its territory outward to the stars. Angkor contends not only with deadly alien enemies planning to contain him, but also treachery on Earth. 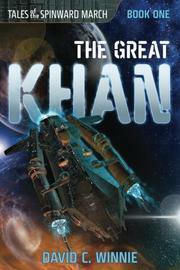 A framing story informs readers that the Terran Empire will eventually spread throughout the universe, its original rulers becoming legendary, godlike figures, and this installment explains how that all came to be, with Buddhist underpinnings to Angkor’s audacious scheme to genetically forge a far-reaching line of imperial descendants. This is an impressive inception volume in a prospective saga, considering its ambitions, and it makes a good move right out of the gate by drawing from the rich well of Asian culture and values. Occasionally the narrative takes a dizzying, great leap forward over cosmic victories and wars that slaughter millions, and some foes become friends (and vice versa) in the rapid span of a few pages. But while similar contributions to the fantasy/sci-fi realm spend too many pages setting up rules and characters who may only come to the fore much later on, Winnie offers plenty of action and a firm enough finale that readers may enjoy this book as a stand-alone work. In Angkor, the story has a nuanced hero who, like the storied Genghis Khan, can seem enlightened and brilliant yet also perpetuate barbaric deeds that associate him with ruthless conquest. A promising launch to a visionary space-empire series with multicultural insight.